One billion years ago, the granite that formed Enchanted Rock was part of a large pool of magma, or hot liquid rock, perhaps seven miles below the earth’s surface. It pushed up into the rock above in places, then cooled and hardened very slowly, turning into granite. Over time, the surface rock and soil wore away. The pushed-up areas are the domes you see in the park. The domes are a small and visible part of a huge underground area of granite, called a batholith. The Enchanted Rock Batholith stretches 62 square miles; most of it is underground. The commanding expanse of the universe and our own Milky Way galaxy presides over the underground batholith and uplifted granite domes of Enchanted Rock. Preserving the pristine darkness of the night skies is becoming increasingly important to the park so that visitors can enjoy the wonder of the night sky. The skies over the park are still dark enough to view the Milky Way, but they need to be protected from encroaching city lights. The park has undertaken significant efforts to minimize artificial illumination at night to allow visitors to enjoy the dark skies. Further, the park has installed a dark sky monitor to measure in real-time the relative darkness of the skies above the park each night. Real-time measurements of sky darkness in the park are displayed below along with an explanation of the measurements. The park has a permanently mounted sky quality monitoring station. The monitoring station includes a sky quality meter mounted above the ranger station and pointed at the zenith along with a computer system that logs readings each night. The computer system posts readings every 15 minutes to this page during the night. The meter is not active during daylight. The Sky Quality Meter is manufactured by Unihedron and recommended by the International Dark Sky Association. The graphs below show the sky darkness fluctuations over time. One chart is based on NElM measurements and the other is based on Mag/Sq Arcsec. Measurements are taken every 15 minutes and posted to the graph in real time. Measurements are taken starting at sunset and continue through the night until sunrise the next morning. Fluctuations in sky darkness are caused by the rising and setting of the moon, the milky way passing directly overhead and man-made sources. Readings greater than 22.5 Mag/Sq Arcsec typically indicate the sky is clouded over which makes the environment very dark because there is no star light or any other light coming from the sky. In the graphs below, the blue line represents the current sky quality meter reading. The line with white circles represents the altitude of the moon in the sky. The current phase of the moon, as a percentage, is indicated in the lower right portion of the graph. Over time you will see the blue line decrease as the moon rises – which means as the moon climbs higher in the sky, the darkness of the sky decreases. Conversely, you will see the blue line increase as the moon sets – which means as the moon gets lower in the sky, the darkness of the sky increases. 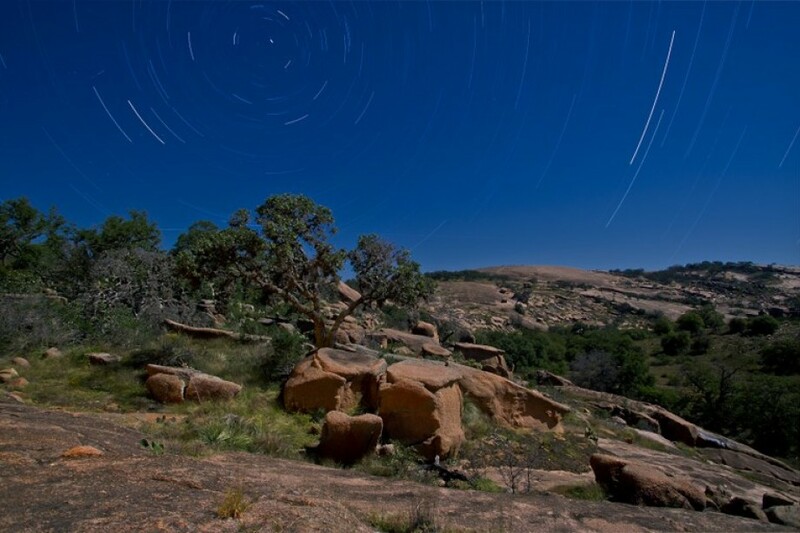 Current moon phase information for Enchanted Rock State Natural Area can be found here. A current moon phase calendar can be found here. The Sky Quality Monitoring station is located at the park. 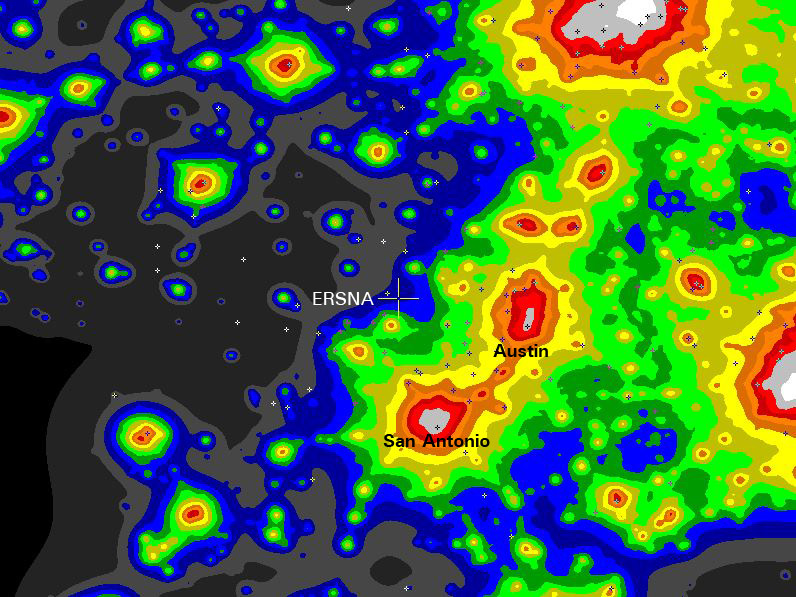 The map below shows the sky glow around the park with colors that match the Bortle scale. Enchanted Rock is designated at the ERSNA crosshairs. 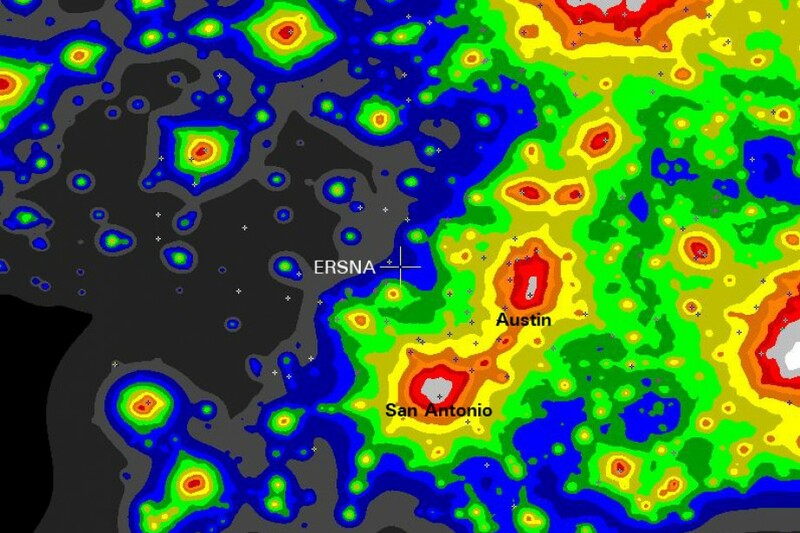 The cities of Austin and San Antonio are indicated. The park also has a Clear Sky Chart. A Clear Sky Chart is an astronomer’s forecast about sky conditions, including, darkness, cloudiness, transparency and the seeing quality. More information about the Clear Sky Chart can be found here.